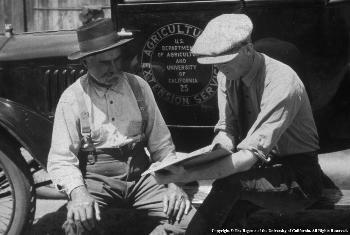 Looking for historic photos to use in your UCCE Centennial outreach materials? Check out the UCCE Centennial Special Library in the ANR Repository. ANR Portal log-in is required to access this collection. You can also search the entire Repository using the search term "historic" or "vintage" to find other photos that have not been placed into in the UCCE Centennial Special Library. Another great source is the Fritz-Metcalf Photograph Collection. It is a home to about 9,000 photographs relating primarily to forestry, conservation, and the lumber industry in California; many images are Cooperative Extension related. 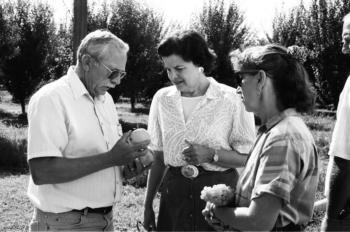 Have you uncovered historic photos of UC Cooperative Extension in your county? We want your photos! Media Librarian Evett Kilmartin is coordinating the digitization of historic photographs and will upload them to the ANR Repository. You can either scan and archive the photos yourself in the ANR Repository and add them to the UCCE Centennial Special Library, or send them to us here in Davis. Contact Evett Kilmartin to make arrangements.